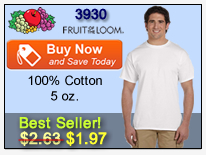 Plain T-Shirts are available here from trusted brands such as Hanes, Gildan, Anvil, Jerzees, Fruit of the Loom and more. We don't do any design or printing, we just sell plain t-shirts with nothing on them. Our plain t-shirts are offered in bulk at wholesale prices which go down the more you order. 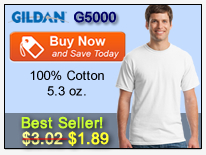 The best price of plain t-shirts comes when you reach 72 or more of any one style. You can mix and match colors and sizes within a style and still get the quantity discounts. Smaller price breaks occur at quantities of 12 and 36. This doesn't mean you have to order plain t-shirts in set quantities. 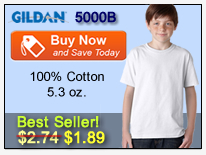 You can order any amount of plain t-shirts that you need, but the price does go down when you reach the bulk quantities mentioned above. 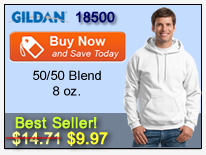 There is absolutely no minimum order requirement for wholesale plain t-shirts. We have a lot of first time customers who will order single quantities of several different brands and styles to check out these options hands on before ordering larger quantities. This way you can be sure that the plain t-shirts you order are just right for your needs. 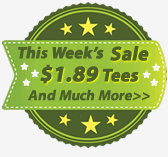 Below is a list of some of our best selling wholesale plain t-shirts. Check out all of our plain t-shirts that are on sale here. View ALL of our plain t-shirts here. We are excited to be your supplier of wholesale plain t-shirts in bulk.